I'm surprised there isn't a thread on this lot yet, so here it is. Amadon recently sold the property that would have been home to the Bambu condos, and is looking to build a 2,.8 acre residential/commercial development in Mill Bay. Anyone have any details on this? Who bought it, etc? I understand that the "Buckerfield" lands currently aka Bambu was sold to Anthem Properties, current owner of Market Square. Perhaps it would be better to name this thread as the Buckerfield Property and Theatre Alley.. Since Theatre Alley has been blocked for several years now, it might get forgotten..
That quote from businessvi.ca was from a Feb 10th, 2007 release. Therefore it's been sold again. There's still an alley somewhere in there? Or is this one of those things where the city is requiring another through block walkway, even if there's nothing along it? Did you get burnt by security? No cop's ever caught me. I'm like mercury on a greased ice cube, baby. Theatre Alley is a former walkway that used to be on this property at the far East end. 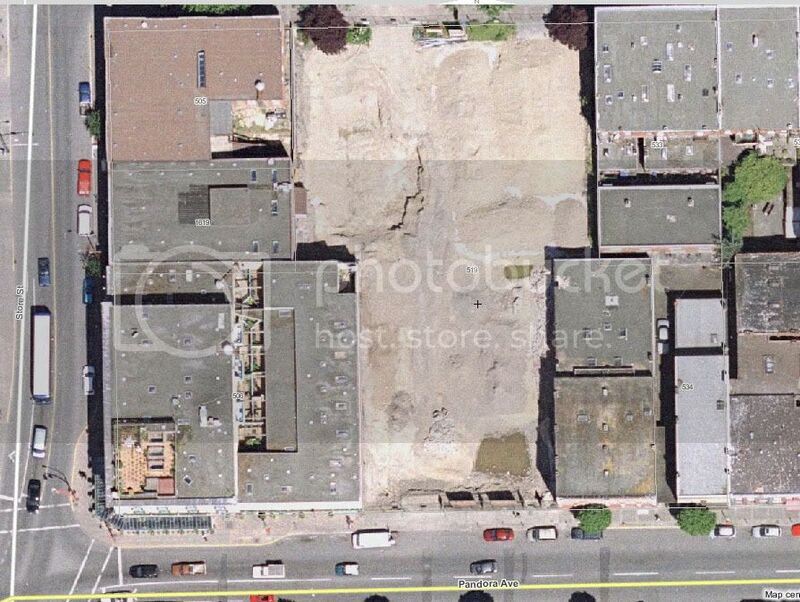 Do the owners of this lot have to pay the city for the lost parking revenue out front due to the cement blocks that are used to help hold up the burnt building? Good question. Perhaps insurance covers that? Am I misunderstanding something here? Amadon was the Bambu developer, yes? Thus, the reference to Amadon's recent sale of the property must refer to the events of late 2005, when Anthem acquired it. Merchants in the Market Square, Chinatown, and Store Street area have suffered from lack of parking, he (Deputy City Engineer Clive Timms) said. This statement was made in 1987. No new parking has been built around there since then (nothing significant, anyway). So are the merchants still suffering from lack of parking or did the problem magically go away? You're right, aastra. AFAIK, the land is still owned by Anthem (owners of Market Square). No new news here. One of them mentioned that he hadn't seen people from a store in Market Sq. come in to "The Bean" since they started the Bambu project - parking lot closed.. Closed pathway means resistribution of the coffee and muffin market eh? If you look at the sign that the Downtown Residential Assoc has posted to mark mark their work on tarting up the penetenitary fencing around the site you will see that they have noted Theatre Alley.. If any of you have crossed through there when the site was a parking lot, you may have seen Theatre Alley marked out with survey graffitii on the pavement.. Earlier this year someone posted a 1910? landuse map which included Chinatown and the Chinese Theatre was shown on it..
What the hell? That article was dated feb 10th 2007. Whatever. Sorry for the confusion. Was good to get site back on people's radar..
Merchants and businesses are still suffering from lack of parking... for staff as much as customers. Some of the employees at Swans still need to run out every so often to plug metres. The alley markings photo and 1910 map Icebergalley mentions are in the history link I posted above. Vibrant Victorians like good walkways and hate bad ones. I think a revived Theatre Alley could be a good one. Al walkway through that property would be good as long as there are things in the walkway, like residential entrances or stores. Like Fan Tan alley. With retail all the way up the alley I think it would work great. Dragon Alley is nice, and Fan Tan alley is marvelous.